If I have any cooking mojo at all, I got it from my Mom. She's an old-school, from-scratch, homemade-is-best wonder. Her Sunday dinners are legendary, she once had a small business selling her cinnamon rolls, and it's not a birthday in my house unless I have pan of her chocolate cake baking in my oven. It's the scent of celebration to me. When I was a kid, our kitchen was a virtual machine each December. My Mom would make close to 20 kinds of cookies and several types of candy. (And that doesn't include the cinnamon rolls for Christmas morning, the ice cream cake roll for the Sunday dinner before Christmas, the Hannukah meal we all loved, etc.) (I have no idea how my siblings and I aren't all obese.) She gave away a lot of her bounty, packing plates of sweets for teacher's gifts and staff presents. And we kids, we were fine with that. As long as she didn't give away a SINGLE Chocolate Mint Brownie. Because those double-iced, rich and minty, buttery bites were our favorite, and they were not for sharing. They were ours. ALL OURS. So today, I'm sharing the recipe with you. In hopes that you'll make them for your own family and watch them turn into mini-Grinches after tasting them. Because I'm clearly not sharing the pan I made this week. Warning: This recipe uses more than a pound of butter and half a dozen eggs and more than two pounds of sugar. And it is worth every single calorie. 1. Cream butter and sugar until light and fluffy. Add eggs and vanilla and beat until combined. Mix in flour, salt and cocoa powder. 2. Spread in a 10x15 jelly roll pan. 3. Bake in a preheated 350-degree oven for 25-30 minutes. 1. Yes, that's 3 sticks of butter, Marge. It's worth it. 2. I don't have a jelly roll pan, so I make these in a half-sheet cake pan. They turn out fine. Just cook them a little less. The edges want to crisp up before the middle is done. 3. This makes a lot of brownies. I cut them small, because they are rich, and I get about 7 dozen. Theoretically, you could half this recipe and make it in a 9x13 pan if you'd rather not have such a large batch of goodness in your house. But why would you do something so miserly at the holidays? Why? 1. Beat butter until fluffy. Add sugar in small amounts until throughly mixed. 2. Add milk and beat until icing is fluffy. Add peppermint extract and a few drops of green food coloring at the end. The icing should be buttery, fluffy and mint green. 3. Spread on cool brownies. Chill. 1. If you don't have green food coloring, it wouldn't be the end of the world. The peppermint extract ensure they taste minty. But the green color adds to the overall effect. 2. If you haven't cooled your brownies sufficiently before adding this icing, it will melt and spread out in a puddle. Not that I've ever done this (cough), but I've heard it can be a mess. Patience is your friend. 3. Once they are iced, put the brownies back in your garage or your fridge. You want this icing to be nice and cold before you add the pièce de résistance. 1. Combine chocolate chips and butter in a microwave-safe bowl. Microwave on high for 1 minute. Stir well. If chocolate is not all melted, microwave for 30 more seconds and stir until no chunks remain. 2. Stir mixture until silky and let cool until it's not hot to the touch. 3. 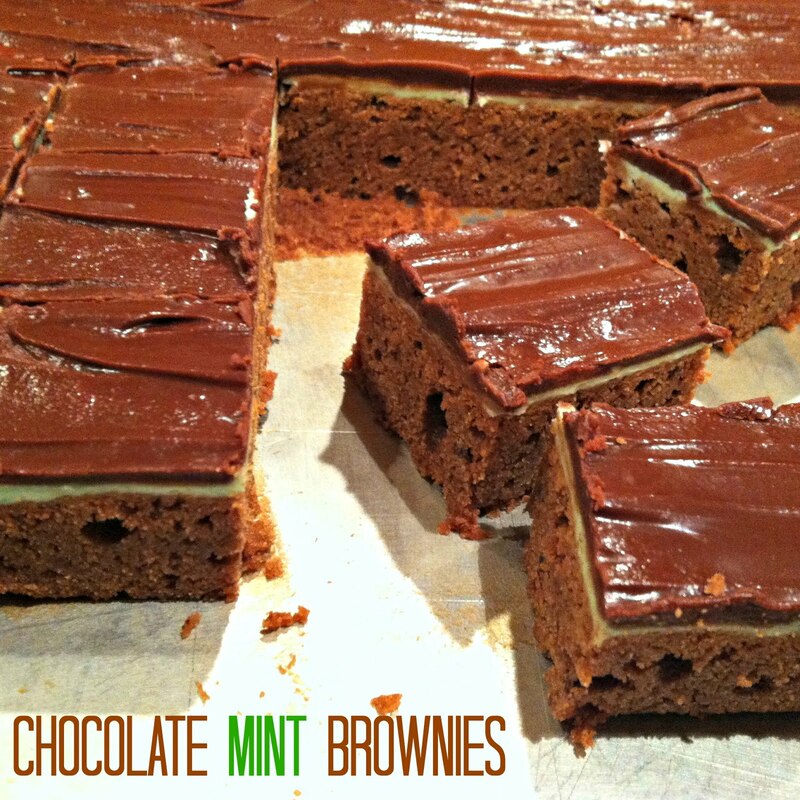 Spread over the mint frosting layer of the brownies and chill one last time before cutting. 1. If you have an off-set spatula, this is when you want to use it. It's a huge help in spreading this silky chocolate over the mint icing. Use a light touch so you don't combine the two layers. 2. Chill throughly before you cut, and if you want the brownies to look purty, use a sharp knife dipped in hot water between each cut. 3. I leave an edge around my pan, because the icing doesn't always reach. 4. The first few brownies you remove will probably be a mess. That's OK. Eat them and move on. Once you have space for the spatula, they will come out easier. 5. Store these brownies in the fridge for the best results. That chocolate ganache gets gooey in a warm kitchen. Yum. Do you share if people come visit?! LOL Those sound phenomenal. Chocolate and mint are my weakness. These look amazing! Mmmm! Would love one today with my afternoon tea break. Found you in (in)courage, love connecting with other Minnesota bloggers!